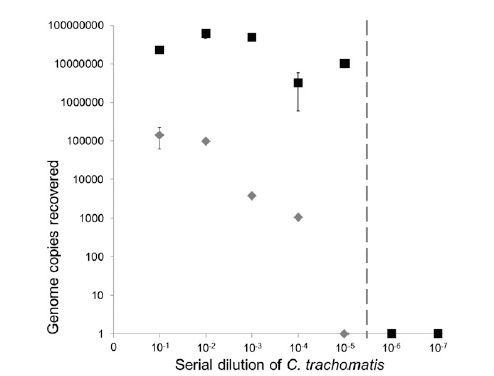 Recovery of C. trachomatis DNA following IMS and IMS-MDA on a serial dilution of C. trachomatis EBs. Post-IMS values are indicated by the gray diamonds and represent total genome copies recovered by IMS. Here at the Sanger Institute, DNA sequencing is what we’re good at. If it has DNA, then we can sequence it. We are using this technology to compare the genetic blueprint of different strains of bacteria and micro-organisms, to examine how they are related to each other, how they spread around the UK and globally, how they are evolving, and what implications this has for our health. The challenge we face is that real samples from patients are extremely variable. They can contain huge amounts of human cells and can be chock-a-block with different bacteria. If you were simply to prepare total DNA from these samples, most of the DNA would be from human tissues or other bacteria, and only a vanishingly small amount of the total DNA would belong to the specific bacteria you were interested in: just like looking for a needle in a haystack. We needed to devise a method that could isolate the pathogen of interest from the complex cocktail of human and bacterial cells and obtain enough DNA from the specific pathogen to then sequence. That’s what we did. Bacterial cells such as Chlamydia have an outer membrane which contains some very distinct molecules. We can use antibodies to target these molecules and bind specifically to a chosen species of bacteria, in our case Chlamydia. We rediscovered a technique called ImmunoMagnetic Separation (IMS), which uses antibodies coupled to tiny magnetic beads that attach to Chlamydia, enriching it from a mixture of cells. The rapid IMS procedure is then followed by amplification of the small amounts of DNA using Multiple Displacement Amplification (MDA). Using IMS-MDA, we have been able to sequence complete Chlamydia genomes directly from clinical samples, the first time that this has been achieved for bacteria. Thinking laterally, we also used this technique to generate genomic data from old Chlamydia samples which have died over decades in archived freezer collections. Such data can provide valuable insights into how Chlamydia infections have changed over time. It is worth mentioning that the amount of Chlamydia present and the integrity of the sample can affect the success, meaning that not every sample can successfully provide a genome, but these are samples that would not yield information by any other means, so the advantage is still huge. Another method for isolating bacteria of interest is to use specific methods of growing, or culturing the bacteria. In some cases this can produce rapid results, but in the case of Chlamydia and many other pathogens, culturing is difficult and perhaps impossible. Using our method, and not relying on culture is liberating and in some cases very cost and time effective. Scientifically, this has opened up new frontiers, for Chlamydia research and for other microorganisms which are difficult or dangerous to culture. There is currently an ongoing discussion about moving away from culture-based diagnostics and surveillance in clinical settings. While this may allow more rapid and sensitive diagnosis, it could also have disastrous consequences in terms of learning about the biology of the organisms. While the discussion carries on, we believe that IMS-MDA offers a rapid and practical way to get at important DNA sequences. Published online in Genome Research March 22, 2013. http://www.genome.org/cgi/doi/10.1101/gr.150037.112.